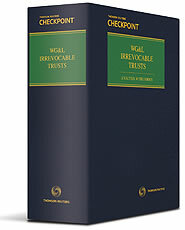 Get the expert guidance plus practical tools you need for the creation and management of irrevocable trusts with Irrevocable Trusts: Analysis with Forms, The book addresses virtually all irrevocable trusts, including those that have special uses, that professionals commonly recommend to their clients for managing their wealth. Included in this Treatise are forms that illustrate how to draft each type of trust to meet a client's needs. Designed to assist the practitioner in drafting accurate trust documents, these forms demonstrate the substance and structure of the clauses that should be included in a properly drafted trust. The sample trust forms are also available on an accompanying disk for the print version. Irrevocable Trusts: Analysis With Forms is regularly updated to remain current with all laws affecting irrevocable trusts.